The 2015 National Medal of Arts to Luis Valdez for bringing Chicano culture to American drama. As a playwright, actor, writer, and director, he illuminates the human spirit in the face of social injustice through award-winning stage, film, and television productions. The 2015 National Humanities Medal to Rudolfo Anaya for his pioneering stories of the American southwest. His works of fiction and poetry celebrate the Chicano experience and reveal universal truths about the human condition. And as an educator, he has spread a love of literature to new generations. 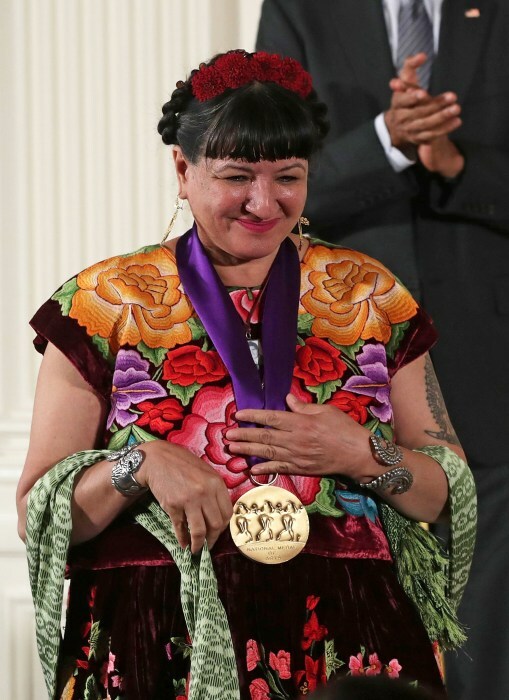 The 2015 National Medal of Arts to Sandra Cisneros for enriching the American narrative. Through her novels, short stories, and poetry, she explores issues of race, class, and gender through the lives of ordinary people straddling multiple cultures. As an educator, she has deepened our understanding of American identity. The 2015 National Medal of Arts to Santiago Jiménez, Jr. for expanding the horizon of American music. He has helped spread traditional conjunto music, blending the sounds and cultures of south Texas and Mexico. His lively melodies performed on the two-button accordion have captivated audiences around the world.